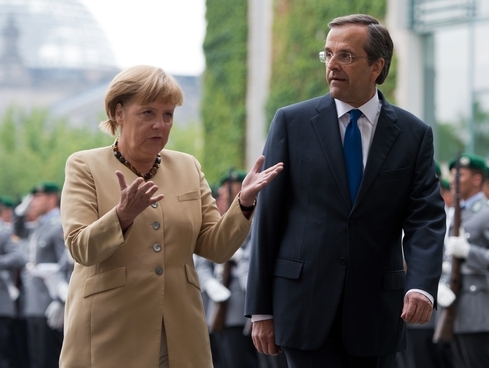 German Chancellor Angela Merkel meets with Greek Prime Minister Antonis Samaras in August. The Greek government met with the European Union, the European Central Bank, and the International Monetary Fund over the weekend. The meeting between Greece and the troika was intended to clarify requirements to qualify for the next round of bailout funds. Greece has already committed to more than 11.5bn euros in spending cuts and another 2bn euros in tax revenue. But Prime Minister Antonis Samaras concedes Greece is unlikely to meet expectations imposed by international lenders. The challenge for Greece is that the plan is highly unpopular, and the country has been rocked by several rounds of widespread protest. The Greek economy has collapsed, contracting by 20 percent over the last year alone. Yet absent external relief from the IMF and EU, Greece faces the prospect of bankruptcy and potential expulsion from the eurozone. And outside of Greece, observers in Spain, Portugal, and other troubled eurozone economies are watching developments closely. The current conundrum in Greece illustrates some of the economic challenges of the common European currency. In normal times, a common currency presents clear benefits. It facilitates closer and more efficient management of the economy, reduces transaction barriers and cost of trade between countries sharing the currency, and can help to reduce economic uncertainty. Indeed, when the euro was adopted as the exclusive currency in the eurozone in 2002, it was highly popular, and many eurozone members enthusiastically embraced the new currency. At the same time, though, the common currency presents a key challenge, particularly during economic downturns. Traditionally, governments have two economic toolkits available to them. Fiscal policy, advocated most famously by John Maynard Keynes, focuses on the use of government revenue (taxation) and expenditures (spending) to influence economic activity in the country. Keynes argued that in good times, governments should run a budget surplus so that during poor economic times, it would have ample revenue to spend, including running a deficit, and prevent a deep recession or depression. Monetary policy, on the other hand, focuses on manipulation of the money supply, often through interest rates, to promote economic growth and stability. Monetary policy, which was most famously promoted by Milton Friedman, provides that governments should lower interest rates to promote economic growth, but should engage in contractionary policies (including raising interest rates) to prevent the economy from overheating. Above all, monetary policy focuses on maintaining a stable money supply and money value, and keeping inflation as close to zero as possible. In practice, governments regularly use a combination of both monetary and fiscal policy to manage economic growth and stability. However, the eurozone encompasses a wide range of countries and economies, ranging from the economic powerhouse of Germany to the crisis-ridden economies of Greece, Spain, and Portugal, to a large number of smaller economies somewhere in the middle. The question of how to balance competing demands across all eurozone economies presents a challenge. The monetary policies that would maintain economic stability and growth in Germany are different from the monetary policies that might be used to prevent economic collapse in Greece. Consequently, the European Central Bank faces the challenge of finding a fine line to walk between the two. The other challenge, of course, is that because Greece is a member of the eurozone, it effectively has cut off one of the two primary economic policies governments might use to address the economic crisis. While the Greek government can continue to use fiscal policy, its ability to use monetary policy to address the crisis is sharply limited by the fact that the Greek government does not control the Greek currency. Not that leaving the eurozone would make things better for Greece. For now, it appears the Greek government is committed to remaining in the seventeen nation eurozone, and the German government is committed to helping Greece remain there. But if Greece is unable to reach agreement with the troika, exiting the eurozone, either on its own terms or aftering being forced out by the other members, may be Greece’s only option. What do you think? Do the benefits of eurozone membership outweigh the costs for the Greek government? Should Greece make the sharp spending cuts demanded by the international community to remain part of the eurozone? How would Greece leaving the eurozone affect future economic developments in other troubled European economies, like Spain and Portugal? Let us know what you think by leaving a comment or answering the poll question below. Two parties fell from power last week, trigging election. In Portugal, the government of Prime Minister José Sócrates fell after a no-confidence motion was passed by the five opposition parties over spending cuts and tax increases intended to address the ongoing economic crisis in the country. A general election looks likely to take place in May or June. Meanwhile, in Canada, Stephen Harper’s minority Conservative government fell after three opposition parties passed a no-confidence motion in response to a finding in the House of Commons that found Harper’s government in contempt of parliament. 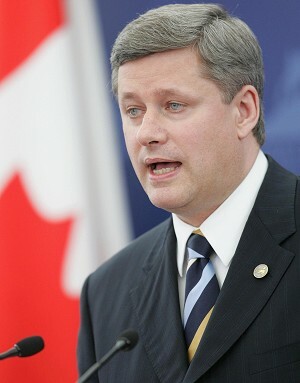 Harper’s government was found to have provided falls information to parliament on at least three separate occasions. New elections are scheduled to take place on May 2. The collapse of Sócrates’ government in Portugal and Harper’s government in Canada highlight both the strengths and weaknesses of parliamentary systems. Unlike presidential systems, where legislative terms are fixed and elections are set according to a regular schedule, parliamentary systems usually only have a maximum length of time between elections, normally five years. Elections can—and indeed, often do—come earlier. The government may call an early election if it feels that doing so can give it a larger majority in parliament. And opposition parties may force an early election by passing a no-confidence motion. Both country’s upcoming elections should provide interesting political theatre. In Canada, public opinion polling is suggesting that Harper’s Conservative Party will likely win a plurality of seats but be denied an absolute majority in the House of Commons, the country’s parliament. If this happens, it will either be forced to seek coalition partners to establish a government, or (more likely) it will try to rule as a minority government again. The problem is that minority governments are inherently unstable, as the government is forced to cobble together a majority vote on every issue from an unstable and often shifting group of Members of Parliament from other parties. In Portugal, the stakes are perhaps even larger. There, the collapse of Sócrates’ government came just days before the European Union was scheduled to decide on a rescue package for the Portuguese economy. That package, which was conditioned on the government of Portugal enacting strict (and widely unpopular) austerity measures, now appears to be in jeopardy. But the ability of the E.U. to discipline the government of Portugal may be limited, as any spillover of the economic crisis from Portugal could endanger the stability of the euro, the common currency used in fifteen E.U. economies, including Spain, France, and Germany. 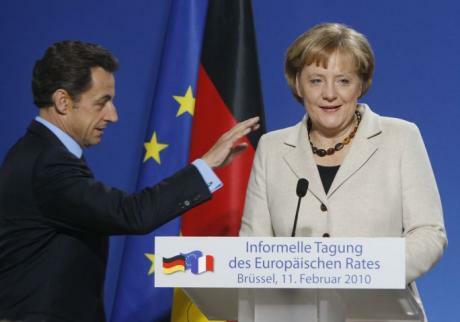 German Chancellor Angela Merkel and French President Nicolas Sarkozy at the Summit of EU Heads of State. The recent spate of crises in the European Union has once again raised questions about the future of the European Union. As Greece and Ireland struggle to rebuild their economies, the debate over the future of the European Union is once again on the stage. At one extreme, Germany and France continue to push for further integration, particularly within the eurozone, the group of seventeen countries using the euro as their unified currency. At the other end, euroskeptics in the European Parliament continue to debate the need for the EU in the first place. Governments in the United Kingdom and many of the former Soviet-bloc countries appear to be hesitant about further economic integration. This tension, which has long been known as the problem of a two-speed Europe, has become more pronounced in light of recent economic crises and the pressure placed on the euro by the collapse of the Greek and Irish economies. Blogging at the Finanical Times, Philip Stephens points out that the euro has to date been maintained largely by the sheer will of the German government and its willingness to devote considerable resources (not to mention foreign policy clout) to support the euro and prop up several of the weaker European economies. Euroskepticism, in other words, has not reached the German Länder. This is not to suggest that German magnanimity is the basis of the euro…Germany clearly benefits as well, as its exports to the rest of the eurozone indicate. But what happens if Germany decides that the euro is no longer a core part of its foreign policy vision? Or more to the point, is the euro in danger? There is good reason to believe that future crises are in store for the eurozone. The economies of Portugal, Italy, and Spain leave considerable room for concern. A far more likely scenario, however, would be the continued development of a two speed Europe, with France and Germany leading the charge for a more integrated economic policy within the eurozone, while Britain, the Scandinavian states, and many of the former Soviet-bloc countries, standing on the sidelines of economic integration while moving forward with political union. Certainly some interesting things to consider. 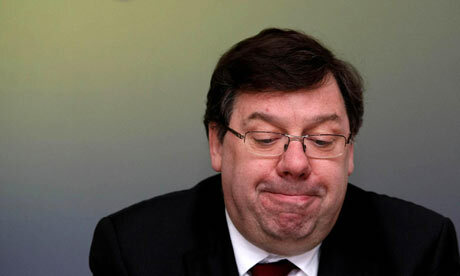 Irish PM Brian Cowen concedes Ireland requies assistance. Once the “Celtic Tiger,” the envy of most other European (and indeed global) economies, the economoy of Ireland now lies in tatters. The economic crisis in Ireland reached boiling point over the weekend, as the government announced it would accept loans from the European Union. The Irish government had been resistant to the idea, believing that the conditions imposed on Ireland as part of the relief package were too strict. According to a statement released Monday by European finance ministers, Ireland will now undertake dramatic “fiscal adjustment” and “structural reform” in order to receive EU and IMF assistance, amounting to some €80bn-€90bn. The proposed relief package covers just a small portion of the bailout needed to pay off foreign banks and keep the Irish economy afloat. Kan Kees de Jager, the Dutch finance minister described the cuts as “fast and deep.” The cuts will likely have profoundly negative effects on the people of Ireland. Already, dramatic cuts in the country’s minimum wages and reductions to universal child benefits have been proposed. Apparently off the table, at least for now, are tax increases. Ireland currently has a corporate tax rate of 12.5 percent and is among the lowest in the world. In many ways, the conditionalities imposed as a part of receiving the relief package echo the era of structural adjustment in the global south. The package has already provoked considerable discussion in the blogosphere. The FT’s Brussels Blog offered extensive analysis. Also blogging at the Financial Times, Gideon Rachman explores the possible effects on the Euro, while the bloggers at Baseline Scenario point to the moral hazard of socializing the risk associated with investment decisions onto the backs of Irish taxpayers. Politically there are costs as well. According to the New York Times, the government of Prime Minister Brian Cowen will likely collapse as a result of the bailout package, forcing new elections early next year. By that time, however, the rescue package will be done, and the new government will be bound by the conditions it imposes. The Irish crisis certainly raises questions about the viability of the Euro and the strength of the Eurozone economies. While Germany appears to be humming along, many other Eurozone members, including Greece, Portugal, Spain, and Ireland are in the doldrums. Greece has already accepted a EU/IMF rescue package, and investors widely believe that Spain and Portugal will also be forced into austerity. Can the Euro survive such a widespread crisis? Is the Euro the New Dollar? The turn of the new year always seems to bring about attempts to prognosticate about what the future will hold. I’ll return to that tomorrow, but for today, a very interesting story about the future of global currencies. On Monday, the Financial Times carried a short story about continental Europeans support for the euro. According to the FT, a large majority of continental Europeans believe the euro will overtake the dollar in global importance within the next five years. There’s certainly good reason to be optimistic; relative to eh U.S. dollar, the euro’s value has spiked in recent years. And over the past couple of weeks, the euro has reached parity with the British pound. There are already more euros in global circulation that there are dollars, and the currency’s role in foreign reserves and capital markets has grown markedly since its introduction in 1999. Fair enough, but why should we care about global currency markets and foreign reserves in the first place? Since the end of World War II, the U.S. dollar has been the de facto global currency. Most international transactions took place in dollars, oil was priced in dollars—as were all other major traded commodities. International lending generally took place in dollars as well. Countries even held dollars in their coffers rather than gold. The use of the dollar as the basis for international exchange established high levels of demand for the U.S. dollar and placed the United States in a privileged position in the international political economy. So long as the dollar was the reserve currency of choice, the U.S. government could always find buyers for treasury bills and a relatively easy (and painless) way to finance the national debt. But as demand for U.S. dollars declines—and an increase in the use of the euro as the international currency of choice would certainly facilitate this decline—the U.S. government could find financing its growing national debt increasingly difficult. We could also see a dramatic decline in the value of the U.S. dollar were such a shift to the euro occur. While this may make U.S. exports more competitive on global markets, it would also make imports more expensive. More importantly, however, as the events in the summer and fall of 2008 demonstrated, a declining U.S. dollar tends to result in increasing commodity prices, particularly oil, as investors hedge against wild swings in currency markets. While it may be too early to know whether (or perhaps when) the euro will replace the dollar as the global reserve currency of choice, the potential impact of such a shift could be dramatic, and the implications of such a shift are well worth consideration. The opening of the Olympic Games this week pushed many stories to the sidelines. Here are some of the important stories from last week that you might have missed. 1. On Friday, fighting between Russian and Georgian forces broke out, marking the worst fighting in nearly twenty years. Georgia claims that the two countries are now officially at war, and accusses Russia of choosing this moment hoping that the Olympic Games will divert attention away from their action. Russia claims they had to intervene to prevent ethnic cleansing on the part of the Georgian government; Georgia claims Russia is involved in ethnic cleansing of its own. The UN Security Council has since taken up the matter. 2. Pakistan’s President Pervez Musharraf canceled his planned trip to the opening of the Olympic Games after the country’s ruling coalition announced plans for impeachment. Musharraf, a former general who came to power through a military coup, has been widely touted as one of the United States’ closest allies in the war on terror, despite the inability of the Pakistani government to effectively address the presence of al Qaeda-linked groups in the northwestern part of the country. The planned impeachment raises concerns about the stability of Pakistan. 3. Salim Hamdan, former driver for Osama bin Laden, was sentenced on Thursday to 66 months in prison for supporting terrorism. After being found not guilty on a number of other charges, Hamdan could be free in less than 6 months after being granted credit for the five years he has already served as a detainee at Guantanamo Bay. The verdict was the first issued by the military tribunal system established to try prisoners captured by the US government in the war on terror. The Pentagon has already announced that Hamdan may be held as an enemy combatant even after he completes the sentence issued by the military tribunal. 4. An economic slowdown in Germany has raised concerns about the economic stability of the European Union. The Euro declined to $1.5378 to US $1, marking a seven-week low. A sharp increase in bankruptcies and the fact that Japan is close to declaring it is in a recession confirm the fact that the economic downturn in the United States is having a global impact. 5. Violence in the Xinjiang region in northwestern China broke out late last week, as Muslim separatists hoped to use the media focus on the country to draw attention to their cause. The attacks, which included both gun battles and the use of explosives, marked the largest outbreak of violence in the region since the 1990s.